The Grimaldis descend from Grimaldo, a Genoese statesman at the time of the early Crusades. He may have been a son of Otto Canella, a consul of the Republic of Genoa in 1133. In turn Grimaldo became a consul in 1160, 1170 and again in 1184. His numerous descendants led maritime expeditions throughout the Mediterranean, the Black Sea, and soon the North Sea. They quickly became one of the most powerful families of Genoa. The Grimaldis feared that the head of a rival Genoese family could break the fragile balance of power in a political coup and become lord of Genoa, as had happened in other Italian cities. They entered into a Guelphic alliance with the Fieschi family and defended their interests with the sword. But the Guelfs were banned from the City in 1271, and took refuge in their castles in Liguria and Provence. They signed a treaty with Charles of Anjou, King of Naples and Count of Provence to retake control of Genoa, and generally to provide mutual assistance. In 1276, they accepted a peace under the auspices of the Pope, which however did not put an end to the civil war. Not all the Grimaldis chose to return to Genoa, as they preferred to settle in their fiefdoms, where they could raise armies. In 1299, the Grimaldis and their allies launched a few galleys to attack the port of Genoa before taking refuge on the Western Riviera. During the following years, the Grimaldis entered into different alliances that would allow them to return to power in Genoa. This time, it was the turn of their rivals, the Spinola family, to be exiled from the city. During this period, both the Guelphs and Ghibellines took and abandoned the castle of Monaco, which was ideally located to launch political and military operations against Genoa. Therefore, the tale of Francis Grimaldi and his faction — who took the castle of Monaco disguised as friars in 1297 — is largely anecdotal. In the early 14th century, the Aragonese raided the shores of Provence and Liguria, challenging Genoa and King Robert of Provence. In 1353, the combined fleet of eighty Venetian and Aragonese galleys gathered in Sardinia to meet the fleet of sixty galleys under the command of Anthony Grimaldi. Only nineteen Genoese vessels survived the battle. Fearing an invasion, Genoa rushed to request the protection of the Lord of Milan. Several of the oldest feudal branches of the House of Grimaldi appeared during these conflicts, such as the branches of Antibes, Beuil, Nice, Puget, and Sicily. In 1395, the Grimaldis took advantage of the discords in Genoa to take possession of Monaco, which they then ruled as a condominium. This is the origin of today's principality. As was customary in Genoa, the Grimaldis organised their family ties within a corporation called albergo. In the political reform of 1528, the Grimaldi became one of the 28 alberghi of the Republic of Genoa, which included the Doria and Pallavicini families, and to which other families were formally invited to join. The House of Grimaldi provided several doges, cardinals, cabinet ministers, and military officers of historical note. By convention, sovereign European houses are reckoned in the male line. Therefore, since 1731, it has been determined genealogically that it was in fact the French noble House of Goyon-Matignon that ruled as Princes of Monaco until 1949. However, one of the terms of James de Goyon de Matignon becoming Prince of Monaco jure uxoris was that he adopt the name and arms of Grimaldi so that the house would be preserved on the throne, and the right of succession was through his wife Louise-Hippolyte Grimaldi, who abdicated in her husband's favour. Similarly, when Charlotte Louvet was legitimised in 1911 and made successor to Monaco, her husband, Count Pierre de Polignac, adopted, as a condition of the marriage, the name and arms of Grimaldi. In this way the "Grimaldi" name and arms were continued. 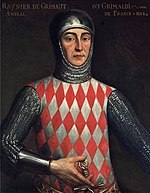 There is a branch of the Grimaldi family in England who believe they have more right to the throne as they are descended from an all-male line from Alessandro Maria Grimaldi, an exile from Genoa, himself a direct descendant of Otto Canella, the father of Grimaldo Canella, who started the patronymic "Grimaldi." Until 2002, a treaty between Monaco and France stated that if the reigning Prince ever failed to leave dynastic offspring, then sovereignty over the Grimaldi realm would revert to France. The 2002 agreement modified this to expand the pool of potential heirs to dynastic collaterals of the reigning Prince (excluding adoptive heirs, hitherto allowed, e.g. Princess Charlotte and her descendants), guaranteeing Monegasque independence. Article I of Monaco's house law requires that the reigning Prince or Princess bear the surname of Grimaldi. The coat of arms of the House of Grimaldi is simply described as fusily argent and gules, i.e., a red and white diamond pattern, with no further modifiers. Albert II of Monaco, Sovereign Prince of Monaco, son and successor of Rainier III and Grace Kelly. Charlène de Monaco, Princess Consort of Monaco. Jacques, Hereditary Prince of Monaco, and son of Albert II and Charlène. Princess Gabriella, Countess of Carladès, daughter of Albert II and Charlène. Caroline, Princess of Hanover, older sister of Albert II and Stéphanie. Andrea Casiraghi, Charlotte Casiraghi, and Pierre Casiraghi, children of the princess Caroline of Monaco and the late Stefano Casiraghi. Princess Alexandra of Hanover, daughter of Princess Caroline of Monaco with her present husband, Ernst August, Prince of Hanover. Princess Stéphanie of Monaco, younger sister of Albert II and Caroline. Louis Robert Paul Ducruet, Pauline Grace Maguy Ducruet, and Camille Maria Gottlieb, children of Stéphanie of Monaco. Elisabeth Anne de Massy (born 1947). She married twice, has two children and who from time to time represents her cousin the monarch of Monaco. Jean-Léonard Taubert-Natta de Massy (born in 1974; Jean-Léonard is Baron de Taubert, Count of Natta, Marquis de Tonco, and Baron de Massy). Son of its first husband, the Baron Bernard Alexandre de Taubert-Natta (1941-1989) (married in Monaco, 19 of January 1974). Jean-Léonard married in Monaco on 25 April 2009 with Suzanne Chrimes. Mélanie-Antoinette Costello de Massy (born in 1985). With her second husband, Nicolai Vladimir Costello (n. 1943), also named of Lusignan. They married on 18 October 1984 in London. Nicolai is a ballet choreographer. Christian Louis de Massy (born in Monaco, 17 January 1949). Married four times and with offspring. Christine Alix de Massy (Noghès) (Monaco, 8 July 1951 - February 15, 1989), married in Monaco on 14 February 1972 and divorced in 1976 from Charles Wayne Knecht (born in Philadelphia, Pennsylvania, 23 of November 1944), they had a son, Keith Sebastian. She remarried on March 25, 1988 with Leon Leroy, without descendants. The Royal Family of Monaco is related by its ancestors with houses including: House of Baden, House of Lorraine, House of Württemberg, House of Hannover, Polignac, Ducal House of Hamilton, House of Urach, House of Métrode-Westerloo, House of Bavaria, House of Liechtenstein, of Hesse and an ancestor Guillermo Carlos Florestán Gero Crescencio who had been declared King of Lithuania with the name of Mindaugas II of Lithuania, although it was invalidated its appointment later, was the eldest son of William I of Urach (Head of a morganatic branch of the House of Württemberg) and his second wife, Florestina of Monaco, who was occasionally acting as Regent of Monaco (daughter of Florestan I of Monaco). Maria de Lorraine (Paris, 12 August 1674 - Monaco, October 30, 1724) was an aristocrat of the House of Lorraine by birth, and princess of Monaco by its marriage with Antonio I of Monaco. She was the mother of Luisa Hipólita of Monaco, the sole sovereign princess of Monaco. Louise d'Aumont (Paris, 22 October 1759 - December 13, 1826) was a French nobleman, the only daughter of Louis Marie d'Aumont, Duke d'Aumont, Duke consort of Mazarin and of the Meilleraye (1732-17 ??) and his wife, Luisa Joan Durfort, Duchess of Mazarin and of the Meilleraye (Paris, 1 September - Paris, 17 of March 1781). William Friedrich Wilhelm, Alexander Ferdinand Graf von Württemberg, July 6, 1941, in the German city of Berlin. of 1810, - 17 of July 1869, Castle of Lichtenstein) 15 of February 1863 in Monaco, married with the princess Florestina of Monaco ([[Fontenay-aux , October 2 / October 22, 1833 - Stuttgart, April 4, 1897), daughter of the Prince Sovereign Florestan I of Monaco, and had two children. 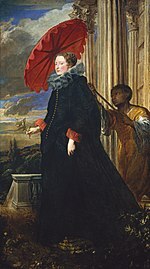 (1639 - June 4, 1678) was a French aristocrat by birth, and Princess of Monaco as the wife of Louis I of Monaco] . Jaime Francisco Leonor Goyon de Matignon Torigni-sur-Vire], 21 November 1689 - Paris, April 23, 1751), Count of Torigni, was the son of Jacques III Goyon de Matignon and his wife Charlotte Goyon de Matignon. He was Duke of Valentinois and Prince Consort of Monaco (1715-1731), for his marriage to the Luisa Hippolyta of Monaco. He was the founder of the Grimaldi-Goyon branch of Matignon. Countess Mária Matild Georgina Festétics de Tólna (1881-1953), half-sister of Prince Louis II of Monaco and married to Prince Karl Emil von House of Fürstenberg. Prince György Tasziló József Festétics de Tólna (1882-1941), half-brother of Prince Louis II of Monaco and married to the Countess Marie Franziska von Haugwitz. Countess Alexandra Olga Eugenia Festétics de Tólna (1884-1963), half-sister of Prince Louis II of Monaco and married first to Prince Karl von Windisch-Grätz and then with the Prince Erwin zu Hohenlohe-Waldenburg-Schillingsfürst. "Countess Karola Friderika Mária Festétics of Tólna" (1888-1951), half sister of the Prince Louis II of Monaco and married with the baron Oskar Gautsch von Frankenthurn. During his forty years of marriage to the Count, after Prince Festétics of Tólna, Lady Maria Victoria supervised the improvements and extensions of the Palace Festétics, Keszthely, to the west of Hungary. Duquesa Amalia María de Baviera (en alemán: Amalie Maria in Bayern) (Múnich, Baviera, 24 de diciembre de 1865 - Stuttgart, Wurtemberg, 26 de mayo de 1912) fue la hija única del duque Carlos Teodoro de Baviera y de su primera esposa, la princesa Sofía de Sajonia. Amalia era miembro de la Casa de Wittelsbach y duquesa de Baviera por nacimiento, contrajo matrimonio con el nieto del Príncipe Florestán I de Mónaco, el Duque de Urach Guillermo II de Urach, Rey nominal de Lituania con el nombre de Mindaugas II, hijo de la princesa Florestina de Mónaco por tanto también descendiente de la Casa de Grimaldi.
' Princess of Urach (1894-1962) 'granddaughter of the princess Florestina of Monaco by so much member of line of the House of Grimaldi to being great-granddaughter of the sovereign of Monaco and married with the prince Carlos Luis of Liechtenstein (1878-1955), uncle of Francisco Jose II of Liechtenstein, with descendants. Princess Matilde de Urach (1912-2001), also granddaughter of the Princess Florestina of Monaco by so much member of line of the Grimaldi House to being great-granddaughter of the [ sovereign of Monaco, who married the Prince Frederick Charles of Hohenlohe-Waldenburg-Schillingsfürst, with descendants. He died in 1912 in Stuttgart, Kingdom of Württemberg, at the age of 47, after the birth of his ninth son. "Countess Antonieta de Mérode-Westerloo" (Antonieta Ghislaine) (Brussels, September 28, 1828 - Paris, February 10, 1864) of Monaco, by its marriage with the future prince Carlos III of Monaco. Antonieta was born in Brussels, being daughter of the count Werner de Mérode (1797-1840) and his wife, the countess Victoire de Spangen d'Uyternesse (1797-1845). She was a sister, among six others, of the Countess Luisa de Mérode-Westerloo, mother of which she was during almost three years queen consort of Spain, Maria Victoria dal Pozzo. 'Prince Pedro de Polignac' , Duke of Valentinois; Prince of Monaco (October 24, 1895 - November 10, 1964) was the father of Raniero III of Monaco, and therefore paternal grandfather of Albert II of Monaco. He was a promoter of the arts, music and literature in Monaco and worked as a representative of the delegation of his country in UNESCO and International Olympic Committee, was the fourth son and the youngest of the count Maxence Melchior Edouard Marie Louis de Polignac (Château de Kerscamp, Morbihan, Brittany, France, 13 of December 1857 - Château de Kerscamp, Brittany, France, 28 of November 1936) and his Mexican wife in Paris, 10 of October 1881), Susana Mariana Estefanía Francisca de Paula of the Heart of the Tower and Mier (Mexico, 2 of September 1858 - Talence, Gironde, 15 of August 1913) .3 Its mother, Susana (well-known like Suzanne), was sister-in-law of the daughter of Porfirio Díaz, and part of the Mexican aristocracy. Ernesto Augusto de Hannover (February 26, 1954, Hannover, West Germany) is the pretender to the throne of Hannover and is prince of Hannover, Duke of Brunswick Luneburgo. He is the husband of the princess Carolina of Monaco with whom he has a daughter, the Princess Alejandra of Hannover, born 20 of July 1999. It is the second of the six children who had Ernesto Augusto of Hanover, Prince of Hannover and Duke of Brunswick and Lüneburg, and his first wife, the princess Ortrudis of Schleswig-Holstein-Sonderburg-Glücksburg. Ernesto is first cousin of queen Dona Sofia of Spain, since its father was brother of the queen Federica of Greece and cousin of the Queen Isabel II of England. La Condesa Beatrice Borromeo Daughter of Count Carlos Fernando Borromeo and his second wife, Paola Marzotto) who July 2015 contracted marriage with Pierre Casiraghi son of the Princess Carolina of Monaco in the hall of the throne of palace. Grimaldo Canella, consul of the Republic of Genoa, founder of this House. Hubert Grimaldi, first to bear the Grimaldi patronymic name. Girolamo (died 1543). Created a Cardinal in 1527. He married Francisca Cattaneo of Genoese and had five children. After her death he entered holy orders. He was a Senator of Genoa. Edwards, Anne. The Grimaldis of Monaco. William Morrow, 1992. Marek, Miroslav. "Detailed Grimaldi Genealogy". Genealogy.EU.